Our good friend Jason Owen is at it again! We love working with Jason as he is one of the best project managers in the business. Jason is an expert in incorporating River-Recovered® and reclaimed wood to elevate different types of residential and commercial spaces. 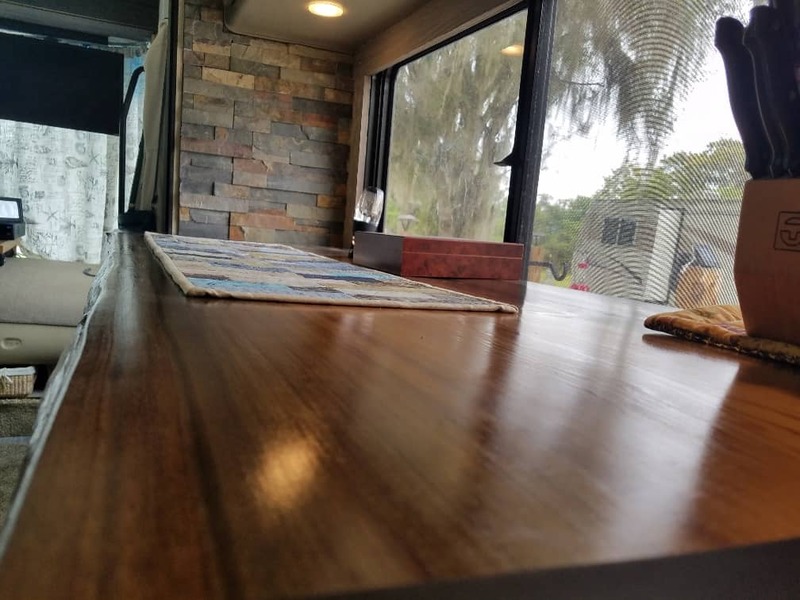 His latest project resulted in an impressive transformation of the kitchenette countertop in his luxury motorhome. Originally bland laminate countertops, Jason used a 1 ½” thick slab of Goodwin’s sinker cypress to breathe new life into the tiny space. After a little sanding and oil finish (which Jason performed himself), the slab’s live edge perfectly complemented the brick back wall of the kitchenette. The versatility of the sinker cypress is expressed in its ability to offer a sophisticated look while maintaining the desired “cozy” feeling. You may recall reading about the Nimbus building project, nominated for a 2017 AIA people’s choice award. Goodwin partnered with Jason and Trimark Properties to mill pine beams from an old depot building to create gorgeous building reclaimed longleaf pine feature wall. We also provided reclaimed wood for the staircase, treads and landing. Goodwin and Jason worked together again when Goodwin provided River-Recovered® Heart Cypress Character for a ceiling Jason installed on a residential porch. Interested in learning more about how sinker cypress and reclaimed wood can transform any space in your home, office or RV? Give us a call at 800-336-3118 – our antique wood experts are ready to help!